It was 4th grade – Miss Houston’s class. She was a favorite of mine and the one who made me learn to love poetry. But she had just failed me miserably in a test, oddly enough, I had actually studied for. I thought I had looked up the details of the locations on the globe where the tropics of Cancer and Capricorn appear (23.5° north and south of the equator respectively) – but I had them both off. And I was the only one in class who failed this. I went home in tears. And my Dad got out the encyclopedia to see how it was I had gone so far astray. And lo and behold, my test answers coincided with the encyclopedia’s. So the next day, encyclopedia in hand, Dad went to my class and argued that either the encyclopedia was wrong, or the material Miss Houston was using was wrong – but in either case, I had done my homework and should not be penalized. To her credit, Miss Houston checked everything, found it was her teaching materials which were in error, and announced to the entire class that I alone had gotten the test questions right and everyone else, including her, were wrong. VINDICATION! And it felt so good! Though that would be the last time in my life I would have that delicious experience. 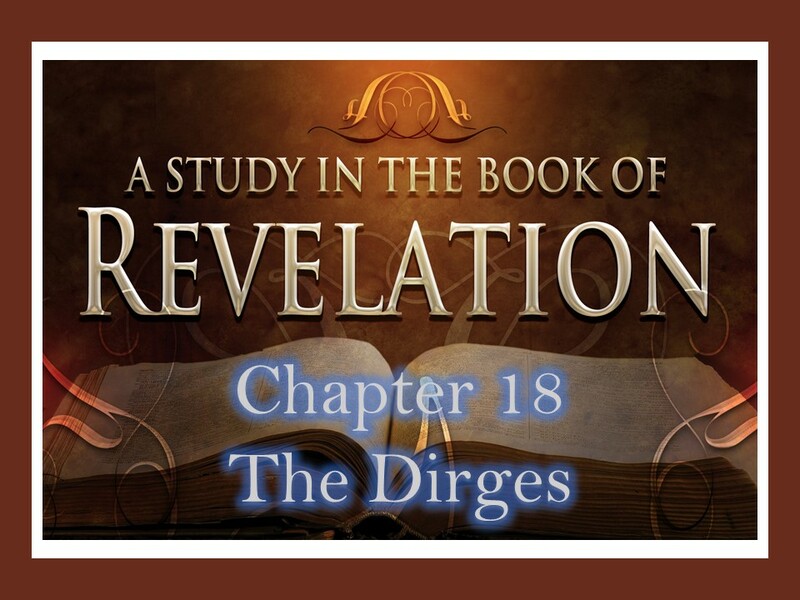 But as we come to this chapter – which I’ve titled “The Dirges” – even though there is great sorrow in it, there is also the glorious theme of vindication for the Believer – and thus it becomes a most encouraging chapter in the midst of much lamentable revelation. So we naturally ask ourselves what is going on here? Is Babylon the world system as seen in opposition to God’s rule and reign, or is it the compromising Church? And of course the answer is a categorical – yes! It is both. The metaphor gets applied to both because once the Church, once those who profess saving faith in Jesus Christ and claim to be His disciples take on the same values as the World without God – the two become indistinguishable. The Church becomes the World, when the Church adopts the World’s mindset and worldview. No matter, how it thinks of itself or what it calls itself. This is true for the Church at large, and for individual Christians. When the supposed Christian (or the greater body of Christians – the Church at large) becomes materialistic and seeks safety and well-being in material wealth; when personal autonomy takes precedence over submission to the Kingship of Jesus; when so-called believers capitulate to letting the Culture determine what is moral and immoral; and when worship of and service to God become merely a matter of personal taste, preference and creativity – The Church becomes the World and the World has become the Church. And thus they will share a common judgment. But with all this talk about Babylon, it might be good to revisit the role this Babylon idea plays in Scripture. We get our first picture of it in Genesis 11:1-9 in how mankind responded to God in the generation after Noah’s Flood. God had commanded mankind in Genesis 1:28 “Be fruitful and multiply and fill the earth and subdue it, and have dominion over the fish of the sea and over the birds of the heavens and over every living thing that moves on the earth.” A command reiterated to Noah and his sons in Gen. 9:1. This is often referred to as the Creation mandate. Mankind had a commission to settle and inhabit the entire earth. The picture was, start at the Garden, and then expand the Garden to encompass the globe. This would be God’s society. But as we see here, they did not want to be dispersed over the face of the whole earth. Man does not want to yield to the authority of God over our lives – but be self-determining. So, they established themselves as a society separate from God’s commanded society. They wanted a life apart from God, serving their own ends and by their own means. Their laws, their values, their morality, and security in their wealth and ability. And they agreed together to build this tower with its top in the heavens. Secular history tells us such towers from this part of the world – the Mesopotamian plane – were called ziggurats and they were religious in nature. The people decided they would not hang around and build society around the blocked entrance to the Garden awaiting the Messiah who could make a way back into the presence of God for them. They would make their own way to God. They could rise to the heavens themselves. Additionally, they wanted a name for themselves rather than be identified as God having authority over them. Those obliterated in the Flood had left no memory, no heritage. These, they imagined, would perpetuate their name no matter what God did. They, would be remembered. The narrative continues: 5-9 And the LORD came down to see the city and the tower, which the children of man had built. And the LORD said, “Behold, they are one people, and they have all one language, and this is only the beginning of what they will do. And nothing that they propose to do will now be impossible for them. Come, let us go down and there confuse their language, so that they may not understand one another’s speech.” So the LORD dispersed them from there over the face of all the earth, and they left off building the city. Therefore its name was called Babel, because there the LORD confused the language of all the earth. And from there the LORD dispersed them over the face of all the earth. “Therefore” vs. 9 says, its name – the name of the city was called Babel. The place where confusion reigns. It is in this same place the Babylonian kingdom would arise with its great city of Babylon. Babylon from then on historically would be the standing symbol of human society establishing itself independent of God and His rule and intents, and the enemy of the people of God. This is why in the Revelation, Babylon serves as the perfect picture of both this present World system, and, the Compromising Church. This chapter like the last one – focuses on the compromising Church. So now let’s work through the passage. This angel is not identified, but the message is clearly that judgment has come. Whether Babylon’s becoming a haunt for uncleanness is WHY it is being judged or if that IS the judgment itself, is debated. But in this picture – as we saw last week – God detests the professing Church when it seeks what the World seeks, buying into the World’s system. Even if we kid ourselves that such compromise is a method to reach the World, the truth is we get seduced by what the World can offer, and the World in turn sees a chance to enrich itself at the Church’s expense. NOTE: When God is abandoned as Lord, something must fill the vacuum. Why is Babylon fallen in judgment? Because in her abandonment of God in His rightful place, she becomes the haunt for every evil thing. Unclean spirits, Unclean birds, Unclean beasts. The tripling here probably meant to be a way of making its uncleanness emphatic. You cannot have true morality or moral goodness apart from God. No matter how outwardly moral or organized a society might seem. Once God is no longer given His rightful place, that society will degenerate to its lowest level. It will undo itself. What does that look like? Romans 1 spells it out: Passion for sexual immorality dominates. Rom. 1:18–31 For the wrath of God is revealed from heaven against all ungodliness and unrighteousness of men…For although they knew God, they did not honor him as God or give thanks to him…and their…hearts were darkened…[T]hey exchanged the glory of the immortal God for images. Therefore God gave them up in the lusts of their hearts to impurity, to the dishonoring of their bodies among themselves…God gave them up to dishonorable passions. [T]heir women exchanged natural relations for those that are contrary to nature; and the men…gave up natural relations with women…consumed with passion for one another…God gave them up to a debased mind…They were filled with all manner of unrighteousness, evil, covetousness, malice…full of envy, murder, strife, deceit, maliciousness. They are gossips, slanderers, haters of God, insolent, haughty, boastful, inventors of evil, disobedient to parents, foolish, faithless, heartless, ruthless. Abandoning God for gods – Abandoning holiness for personal pleasure – No mind to put to death the deeds of the flesh as pleasing in the Father’s sight. This is a call to the faithful not to participate in Babylon’s value system. To not align ourselves with what God will judge in utter violence. How is this done? How do Believers “come out”? The concept here can’t refer to proximity or gathering into cloisters or separate “Christian” communities. 1 Cor. 5 reminds us we can’t totally disassociate ourselves from unbelievers without exiting the planet. The idea is that we “come out” by repudiating the things the World values both in word and deed. By decrying a life built on the World’s system, and by LIVING for different goals. According to God’s revealed plans and purposes rather than our own. Who specifically is issuing this call for judgment isn’t clear. Is it angelic? Is it the Believers who have just been called out? ??? What is clear is that true justice, a full recompense is being called for. Recompense for what? For seeking material luxury at the cost of spiritual fidelity to Christ. And thinking that can be done with impunity. She sought to glorify herself above revealing God. Echo of Babylon? Note well their weeping is over the loss of their perceived riches, not for Babylon’s demise itself. The World has no real use for the Church except as one more way to get what it is always after – possessions, prestige or pleasure. So there is grief over the destruction of the Great Whore, but no weeping and grief over their sins. They only grieve the loss of what they prized so highly. Even witnessing such utter destruction, seeing God judge His Church first, excites no repentance in them – for they have no love of God and His truth. They care only for the loss of this present world and system. They don’t weep for her because they have any true affinity for her, but because of what they lose materially with her passing. Weeping for the spectacle, and for the loss – but no repentance. And woe to the Church, when the merchants of the World can boast their best customers are the very ones who claim our riches are in Heaven and in Christ. And just so we don’t miss it, the list of what constitutes wealth to the people of this world is spelled out: Precious metals and stones, fabrics, woods, food, smells, intoxicants, emoluments, possessions, power, even people – human trafficking. On the heels of the Dirge comes this refrain – from where we aren’t told. It is the summary exposition of the emptiness one experiences, after seeking one’s soul’s satisfaction in anything we could possibly gain in this earthly realm. No matter how good it is in and of itself. All, ALL of what so many, both in and outside the Church have given their entire lives for – will perish in a moment. And what will each one do then? The DIRGE Part 2: 15-19 “The merchants of these wares, who gained wealth from her, will stand far off, in fear of her torment, weeping and mourning aloud, “Alas, alas, for the great city that was clothed in fine linen, in purple and scarlet, adorned with gold, with jewels, and with pearls! For in a single hour all this wealth has been laid waste.” And all shipmasters and seafaring men, sailors and all whose trade is on the sea, stood far off and cried out as they saw the smoke of her burning, “What city was like the great city?” And they threw dust on their heads as they wept and mourned, crying out, “Alas, alas, for the great city where all who had ships at sea grew rich by her wealth! For in a single hour she has been laid waste. SUMMARY: In the midst of this sad and sorrowful dirge comes this most amazing word to the true Believer – to the saints, apostles and prophets. Rejoice over the judgment of the World and the compromising Church? YES! Nowhere is the stark contrast between true and false religion, and between the World and the genuine Church to be seen – than in examining what brings us joy, and what brings us sorrow. Genuine Believers are truly out of step with this World – failing to rejoice in what pleases them, and grieving over God’s concerns more than the World’s. Jesus’ point was that time will show that John and his message were from God, and so Christ’s too. But the world can’t discern such things. It only knows its own time and purposes, and anyone not in sync with those is misunderstood, and disregarded. I don’t care if I am on the right side of human history – I want to be on the right side of God’s future. Nothing is so revealing of our spiritual state as asking what things give us the most joy, and what causes us the most grief? If our supreme happiness and grief are tied to the things of this world; material comforts and security, home, family, career, accomplishments, relationships, status, health possessions, experiences, etc., then we truly are no different than those who do not profess Christ. If we cannot find a higher more perfect joy in Christ and His redeeming love, and the promises to be fulfilled at His return, and our deepest sorrow in our sinfulness and failure to love and glorify Him as we ought – we have great cause to be alarmed over our spiritual state. Only those in Christ can rejoice over the things the World mourns over, and grieve over what seems to bring them the most joy. So again I ask: REJOICE OVER HER? Rejoice over the judgment of the World and the compromising Church? YES! And this for at least 3 reasons. God’s Word WILL be vindicated in full. The zeal of the Lord for justice in His kingdom WILL come to pass. Make no mistake. No wicked man, no wicked act of our or any previous generation will go without Christ bring full and final justice to bear. In this judgment, the faith of the Believer, the faith that leads us to forsake the values of the World is fully vindicated at last. As Asaph prayed in Psalm 73:2–17 He was tripped up for a while when he thought about how wicked men seem to fare so well in this life. They don’t seem to fear death, eat well, and many have fewer troubles than the Christians. This breeds arrogance and pride as it seems the worse they act, the more they prosper. They even scoff at the gospel and blaspheme God. Society embraces them and they think to themselves: “How can God know? Is there knowledge in the Most High?” He began to think, I’ve been an idiot to serve God, its bought me nothing. They’re doing great and I’m struggling every day. And when I thought how to understand this, I said I just don’t get it. Until. Until, I went into the sanctuary of God; then I discerned their end. Love God’s holiness more than temporary human pleasure. Find our true riches and security in the splendor of gaining Christ Jesus. Worship and serve God as He reveals in His Word rather than creating our own spirituality. We will be VINDICATED! And Christ will be all in all. Miss Houston….never to be forgotten. I will be honest and say that sometimes I feel as though I am in Babylon; not because of pervasive sin, but rather ….the Bible, Revelations….it’s depth and breadth, and symbolism and the sheer volume – Wow! At times it leaves one feeling they’re… floundering. I have faith, I just at times lack understanding. Here’s what I will do; I’ll reread your blog. This entry is heavy. I hear you Sarge. But the overall message of the book is really simple and clear: God is going to judge sin. When He does, He will judge the Church that lives and thinks like the World, just as He does the World. So learn to live for His values no matter the cost, and keep looking for Jesus’ return. He WILL come, and He WILL finish the work He’s begun in us. Hallelujah!